At age twelve I got my first motorcycle, a Susuki TS-75 Colt as a present from my dad and uncle. 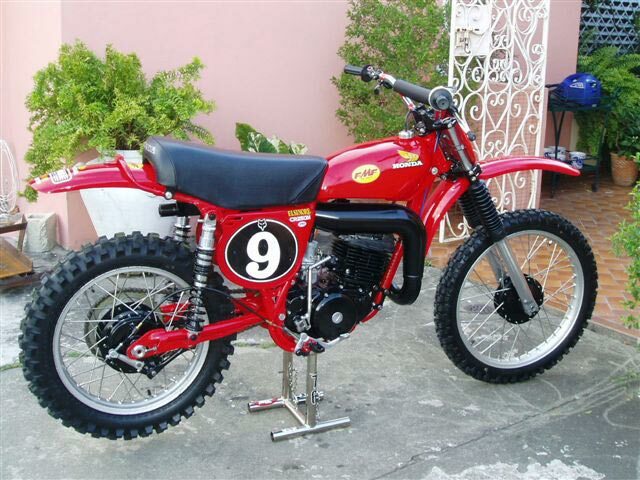 I used to go riding with my uncle, who had at that time a Kawasaki 175-F-7 Enduro on a track near home. We were in those riding when I saw for the first time a Honda Elsinore. I was very impressed with it, in the way it ran and sounded. There are things in life that we never forget and always dream of. And that is my case with the Elsinore. Two years later in 1979 on the same track I saw the Puerto Rico Motorcycle Champion with a 1979 Susuki RM125N running a 20 minute set against a guy with a 1974 Honda Elsinore CR125M and to our surprise, the new Susuki never caught the tired Honda Elsinore. Twenty five years later, I found in a backyard of an old house, a 1976 Honda Elsinore. It was in a very bad condition, but the owner was asking $200 for the bike so I got it. The restoration began. The restoration process took two years. At sometimes it was frustrating, but in the other hand it was satisfying. In the end, when you see the bike completely restored, all those frustrations were gone. I have to thank a few people who helped me in the completion of this project because for me this bike reminds me of one of the best times in my life.